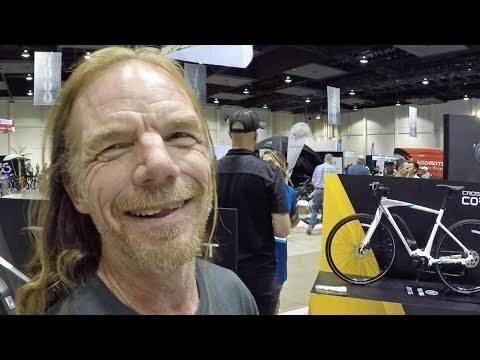 During Interbike 2018 I crossed paths with Ken Foraker, former pro cyclist for Yeti Cycles. He has been working at an electric bike shop called Current Ebikes in Santa Cruz California and built out a custom Focus Paralane to bring to Lake Tahoe for the Outdoor Demo Day event. Ken told me that he had taken a 23 mile ride from Northstar to Kings Beach which included 3,000 feet of climbing. On one of the descents, Ken was able to reach 62mph! Years ago, Ken lost one of his legs when he was hit by a drunk driver in a Buick, so he has removed his right crank arm, uses a clip-in pedal on the left side, and added multiple frame bags from Revelate Designs so he doesn’t have to wear a backpack. One bag had a magnetic clasp, making it easier to access. Ken always brings along metal utensils and hand sanitizer to reduce waste from disposable forks and knives, and considers his bike an adventure bicycle the way it’s setup! He swapped the stock drop bars for a Nitto Albatross handlebar which sweeps back. He said many people in Holland and Asia use this stept-back style handlebar because it’s more comfortable and natural to ride with. His tires are 32c width which improves comfort and stability but still allows him to run fenders. He said it could handle up to 35c size without fenders. During Interbike, Ken crossed paths with one of his heroes named Sonya Looney. He bought some metallic Sharpie permanent markers and had Tonya sign his bike frame! Ken actually recognized me from the EBR review videos and was just super friendly. It was an honor to meet him, and he shared a few tips for other amputee riders who have lost limbs. He says that he has helped them get setup with special interfaces but usually recommends that they try to ride without and practice using clipless (clip in) pedals near grass to relearn. He went so far as to share his email address to help others with adaptive needs: ken@currentebikes.com which is awesome and generous. Ken said that he just wants to help people who are ambulatorily challenged enjoy their sport of choice, he has forearm crutches that are used to walk sometimes but said they just aren’t comfortable… so he prefers cycling. Other topics in this video include his cool California Republic branded water bottle from Camelbak which is easier to drink from on the go, because you can squeeze it to get fluids out vs. messing with a cap. He’s using Shimano Metrea hydraulic disc brakes and attended a Shimano workshop at Interbike, talking about Di2 components and electronic shifting.